Exciting news. 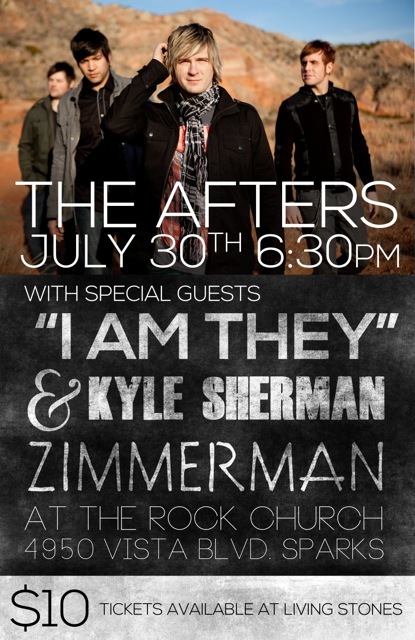 We're opening for the band "the Afters" this month! Details below. Will tickets also be available at the door? Practical tips and tools for worship leaders, music news, and thoughts on loving the messy church. From a little band in a little city writing songs about big things. Discussions of band antics and worship land mines. Our recent EP My Soul Knows" is on iTunes. I lead a band here and a people here that are part of this church planting network. My other blog documents my time on the Truckee River here. If you want to use anything on this site, email info@zimmermanband dot com . Watermark theme. Powered by Blogger.